Hidden in the beautiful Vale of Kerry sit The Forest Cottages ; 3 splendid holiday cottages and log cabin with hot tubs, set in 4 acres of beautiful gardens. The tranquil rural setting makes it the perfect place in which to relax and an ideal base from which to explore the many attractions of Mid Wales including Powis Castle National Trust. 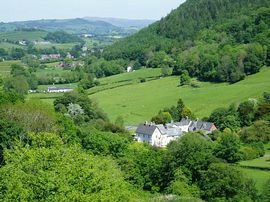 Less than a mile away is Kerry village which has a pub restaurant and it is a 5 minute drive from Newtown on the border of Powys and Shropshire. Each cottage accommodates between 2 and 6 people, with extra beds also possible. Two cottages have private hot tubs. The furnishings and decoration of each cottage are different, but all share a style which respects the original architecture. Children of all ages are welcome and there is an outside play area, toy boxes, a free games room. Wifi Internet available on request in each cottage. Each cottage has is own garden or patio area. At The Forest there is a play area for younger children a games room and a tennis court for everyone's enjoyment. Dogs are only allowed by prior arrangement at the time of booking. 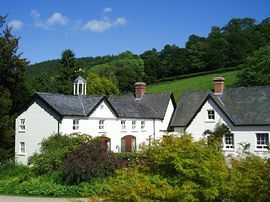 We strive to offer the highest quality self catering accommodation for walkers, riders, cyclists, business people, families and holiday makers, looking for a secluded and tranquil location in which to relax and from which to explore the area of the Marches. 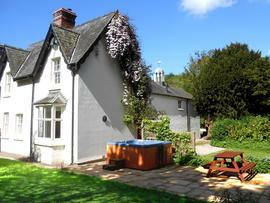 Peaceful, tranquil location in beautiful Welsh countryside. Family friendly with play areas, tennis court and games room. Forest Lodge has wheelchair access and is on a single floor with ramp. Bathroom is not converted for full wheelchair access. 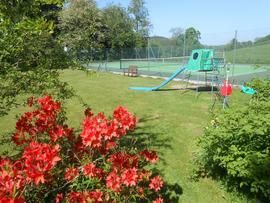 Wifi, tennis court, childrens play area, play fort, gardens, games room. Directions from Newtown: Take the A489 (Kerry Rd at McDonald's traffic lights) for 3 miles and just before you enter Kerry, take the right turning sign posted The Forest into Gilfach Lane. Follow the narrow winding lane for approximately three quarters of a mile and the entrance to The Forest Cottages has black metal gates and is on the left, just past the brook. Directions from Welshpool: Take the A483 all the way to Newtown (McDonalds traffic lights) and follow above. If you use Sat Nav you may be directed onto a narrow lane at Morrisons Supermarket. The lane cuts the corner but is not recommended for most cars. 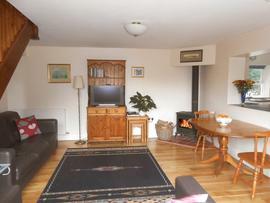 Forest Cottage sleeps 4, hot tub, 2 bedrooms, weekly rates from: £300 to £695, short breaks from £200. Forest Keep sleeps 5, 3 bedrooms, weekly rates from: £285 to £630, short breaks from £175. Forest Lodge sleeps 6, hot tub, 3 bedrooms, weekly rates from: £355 to £850, short breaks from £235. Open all year; change over day usually Friday, but other days may also be possible. Please see our website for customer reviews and feedback.